Is there a skills gap in your organization when it comes to managing Hadoop? 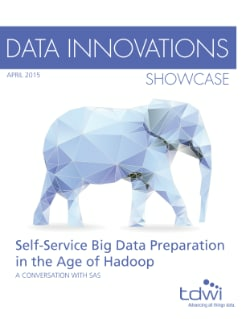 Have you experienced delays in preparing and exploring big data? Learn how SAS® Data Loader for Hadoop enables business users – along with data scientists and IT – to access, profile, transform and cleanse Hadoop data. The best part is, it requires minimal training and no need for coding. Extends an automated, self-service data management layer to the Hadoop platform. Supports SQL query access to data stored in Hadoop. Helps automate the movement of data into and out of the Hadoop platform.